Driverless Mercedes F015 Spotted Around San Francisco! 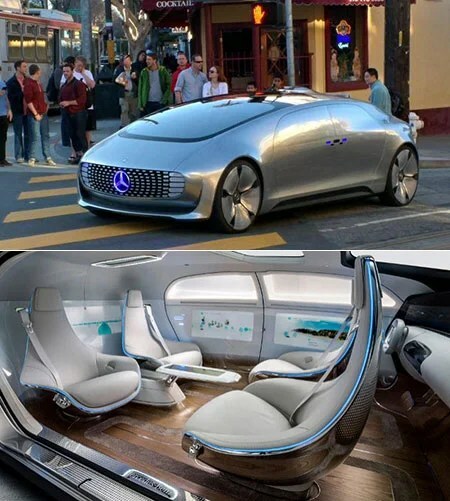 The driverless Mercedes-Benz F015 made its debut at CES 2015 in Las Vegas, but it was spotted cruising around San Francisco just a few days ago. To drive itself around safely, it communicates with its surroundings both visually and acoustically, using a laser projection system. When driving, it can project lights on to the road using its LED headlights to let pedestrians know when to cross. There’s also a manual mode should someone want to take over. “Last Thursday, Mercedes-Benz said the car was driving around the city ‘for running footage and photography for future communication purposes,’ adding that development is still ‘underway’. If the F015 eventually goes into production, its particular specifications could change. It is part of Mercedes’ vision for urban autonomous driving, which would include ‘safe zones’ for self-driving cars,” reports The Daily Mail. Previous article Xbox One Bundle: vier Halo Spiele inklusive! Conqueror UEV 490 is like a Mini Home on Wheels!! Intel Revealed ‘Project Alloy’ first merged reality wireless VR headset! Xbox One Bundle: vier Halo Spiele inklusive!